Summary: Watch it, if only to see that the night is darkest just before the dawn. This is an utterly captivating origin story on how the all singing, all dancing, iconic technicolour musical (with bells on) – Mary Poppins came to be. It follows the story from the perspective of P L Travers, the stern author of the slightly more dour books than most of us (polluted by popular culture) would have believed. Emma Thompson plays the embittered author, in constant emotional turmoil as she relives and explores her own childhood during the making of the movie, and some home truths besides. We join the story with PL in her London home in the 1960’s, twenty years after her books were first published and a while after several print runs have run dry. Though reluctant to adapt the book for the talkies, her Agent corners her, citing her lack of (impending) residual income, and scarcity of new work to take up the offer. The $100,000 advance (a record in its time) more an irritating necessity than easy lure – that’s £1.2 million in today’s money… PL however lives in her own bubble, ridiculing Walt Disney as the guy with the mouse, and devoid of the reality of her situation. She begrudgingly leaves London for LA in 1961, for a two week script read through with screenwriters and musicians from the studio. 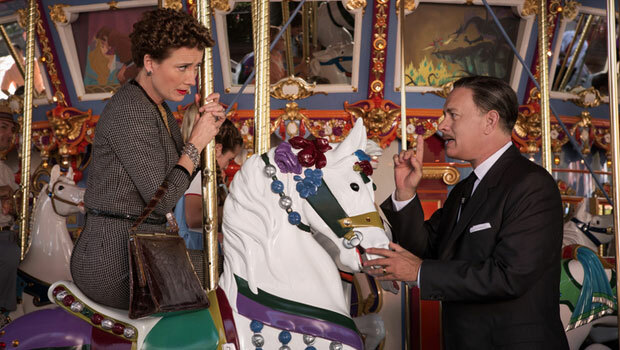 Here we encounter the charismatic Walt Disney himself (Hanks) as he tries to charm and cajole Pam into signing over the rights to the movie. But Travers is her cantankerous iridescent self, flitting from irritable to nonchalant and back again, as she spends much of her time in LA in a self-imposed haze. Through each relationship she has, we see different aspects of her personality, be it with her chauffeur, the musicians, the hotel staff or Walt himself, many of which assist her in coming to terms with her past. How much it actually helped in coming to terms with her childhood, well, only the real Ms Travers could answer that. Her tragic life story – vignettes of her falling out with Disney, unfulfilled personal relationships, and disregard for the film adaptation are well documented, with stories widely available online. Hancock etches the story by flitting effortlessly between flashback and present day, with a pleasant (if somewhat typecast) cameo from Colin Farrell as Travers’ alcoholic fantasist Father, and their intense, layered, yet somewhat disjointed relationship. As the story unravels it shows the many darker truths that she had trouble coming to terms with; that dictated her life and the tragic relationships with those around her, yet inspired one of the most uplifting characters and iconic stories of our times. The performances are cracking, from both of our leads and the ensemble including Farrell, Giamatti and even the under-utilised Rachel Griffiths. It has ‘Oscar’ written all over it, but I liked it as it showed a father who was fallible, a daughter who dared to believe, and from that inevitable pain ensued escapism, and an imagination that went onto inspire millions.